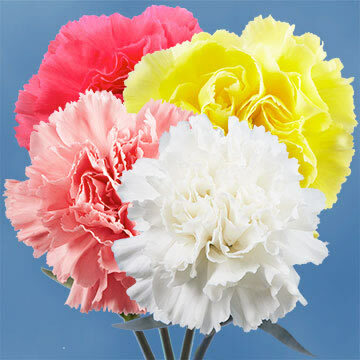 We allow you to pick your own colorful mix of Carnation Flowers that will complement any occasion that you want to spice up with the astonishing colors. You can pick the colors you like in multiples of 25 stems or 1 bunch. From the traditional reds, pinks, and sophisticated whites to novelty patterns and many other colors, Globalrose gives you the freedom to choose among the full range without limitations. 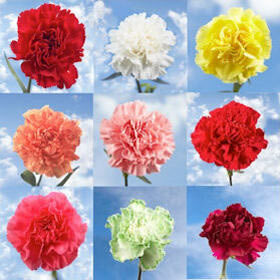 The month of January has the Carnation flower as the floret of the month. They have a long life as a fresh cut floret and amazingly redolent fragrance, which makes them the favorite blossom all over the world. We have prodducts throughout the year, so you can rest assured that if you ever feel like having Carnations ordered, GlobalRose will have them for you! The products from Globalrose are produced in the most modern greenhouses that technology can provide, and Globalrose promises excellence and freshness all year round.